Like the South African leader Nelson Mandela, Aung San Suu Kyi has become an international symbol of peaceful resistance in the face of oppression. The 66-year-old has spent most of the last two decades in some form of detention because of her efforts to bring democracy to military-ruled Burma. She is the daughter of the country’s independence hero, General Aung San, who was assassinated in July 1947 during the World War II transition period, six months before independence. She was only two years old at the time. In 1960 her mother was appointed Burma’s ambassador to Delhi and took Aung San Suu Kyi with her. Four years later she moved to England to study philosophy, politics and economics at Oxford. There she met her future husband, academic Michael Aris. After stints of living and working in Japan and Bhutan, she settled in the UK to raise their two children, Alexander and Kim. But Burma was never far from her thoughts. When she travelled back in Rangoon in 1988 to care for her critically ill mother, Burma was in the midst of major political upheaval. Thousands of people were protesting, demanding democratic reform. “I could not, as my father’s daughter, remain indifferent to all that is going on,” she said in a speech on August 26,1988. Burmese people asked her to lead a revolt against the then-dictator, General Ne Win. Inspired by the non-violent campaigns of U.S. civil rights leader Martin Luther King and India’s Mahatma Gandhi, she organized rallies and travelled around the country, calling for peaceful democratic reform and free elections. But the demonstrations were brutally suppressed by the army, who seized power in a coup on September 18, 1988. Threat of assassination did not stop her from sending her message to anti-governmental dissidents. 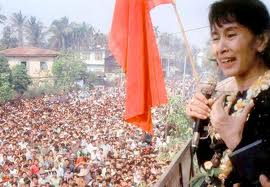 A few months later, without charge and without trial, Aung San Suu Kyi was placed under house arrest. The military government held national elections in May 1990. Aung San Suu Kyi’s National League for Democracy (NLD) Party convincingly won the polls, despite the fact that she herself was under house arrest and disqualified from standing. But the junta refused to hand over control. UN Secretary General Perez de Cuellar, as well as human rights activists from around the world, called for her release, but the military refused to acknowledge them, and continued holding imprisonment for more than two years when the Nobel Prize Committee announced that she had received the 1991 Nobel Prize for Peace. The committee chairman, Francis Sejested, called her “an outstanding example of the power of the powerless”. At times she could briefly meet NLD officials and selected diplomats. But mostly, her detention was solitary confinement. In March 1999 the military gave her permission to travel to the UK to see her dying husband but she refused, fearing they would never allow her back into Burma. What did she do to live life in crescendo while under repeated house arrest? She studied, meditated, worked on her French and Japanese language skills, and relaxed by playing Bach on the piano, all the while patiently focusing on her dream to restore democracy to her country. The last house arrest ended in November 2010; her son Kim Aris was allowed to visit her for the first time in a decade. The first general election in 20 years was held in 2010, and the NLD won overwhelmingly. Since then, the NLD won by-elections in April 2012. David Cameron became the first UK Prime Minister to visit Burma since 1948. He met President Thein Sein and said his government had to demonstrate that recent moves to democracy were “irreversible” for the world to remove its sanctions. Aung San Suu Kyi has peacefully pursued her dream to restore democracy to her country for nearly twenty-four years. Now that her dreams are finally being realized, you can bet that she is living her life in crescendo more than ever.